'I Do' (Lloyd Zurbrigg, R. 1973). Seedling# 69-25-W. TB, 32" (81 cm), Early to midseason bloom and rebloom (September-October in Virginia). 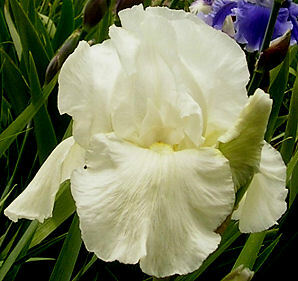 Standards white with slight cast of violet and greenish yellow, green at midrib; falls white with some green texture veining in center; white beard tipped pale yellow; ruffled. 'Grand Baroque' X 'Amy'. Avonbank 1974. From AIS Bulletin #213 April 1974 Introducing I DO-"Just like a bride's bouquet!" Pure white, with a central shimmer of green. Lovely ruffled form. Stems 32". Branching adequate. Texture superb. Fertile both ways. Remonts here in September and October. Straight stems. (Grand Baroque & Amy) Sdlg. 69-25-XL. $25.00. Avonbank Iris Gardens.